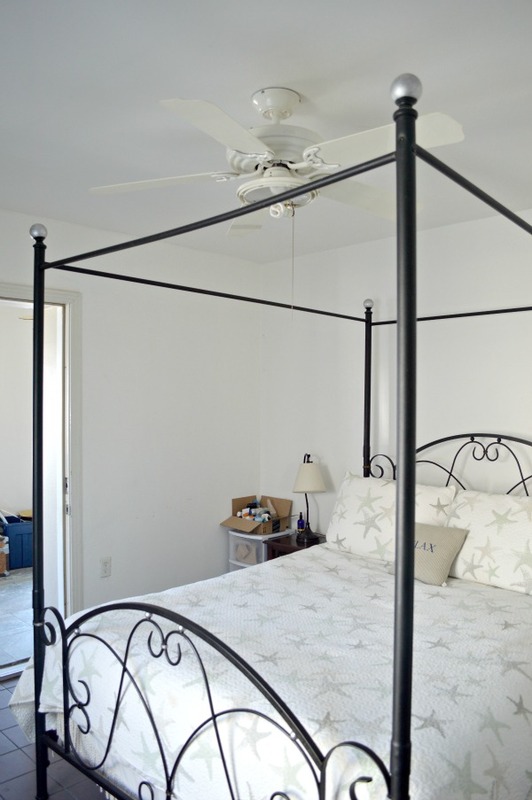 I want to thank you all for giving me a swift kick in the behind to get my coastal bedroom makeover done. Last December when I did my reader survey, I asked what type of projects you wanted to see more of. Decorating was a popular topic. Which is great because I’ve got LOTS of decorating left to finish. You might think that it wasn’t so bad before, just bland. Of course, if you read last weeks post where I shared the real before pictures of what it looked like when we moved in you saw how far this little room has come in the 3 years we’ve been here. Which is why I probably let it go for a year, because compared to what it looked like the day we moved in.. The interim wasn’t so bad, it was just boring. When we added the master bathroom addition, we did some work in this room too. It’s a small room so we removed the old closet with the sliding doors and moved the wall back 2 feet. That closed off the second doorway to our room too. I used the hallway on the other side to build a new linen closet. I needed to let as much light in as possible so I expanded our doorway and added french doors. You can see the entry to our room in my Industrial Shelving post. I got as far as new floors and paint on the wall which is Revere Pewter by Benjamin Moore Paints. But that’s where I ran out of steam. No curtains, no color, orange wood night stands and one lonely burlap monogram project hanging on the wall. 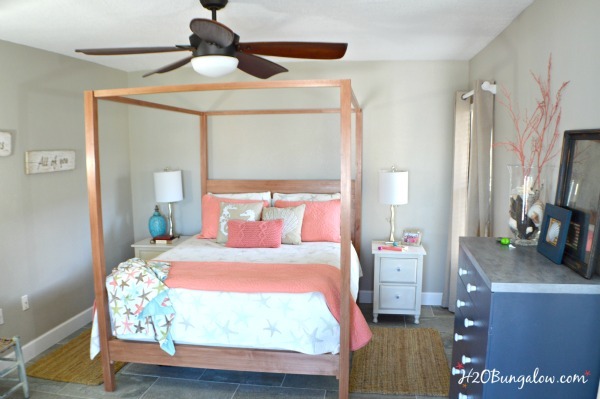 So without further rambling let me share what I accomplished in my coastal bedroom makeover these last few weeks. To me, adding a pop of fresh coastal color made the biggest impact. I love the coral against the neutrals and blues. I was challenged to make the room not too frilly and not too masculine and maximize the light. This room only has 1 window and unlike the pretty light filled coastal bedroom photos you see online, it tends to be dark. So I added neutral curtains that wouldn’t block any sunlight. I shared how I made the DIY curtain rod and my secret for hanging straight curtains. They make such a huge difference. I spotted these lamps at HomeGoods and they had my name written all over them! 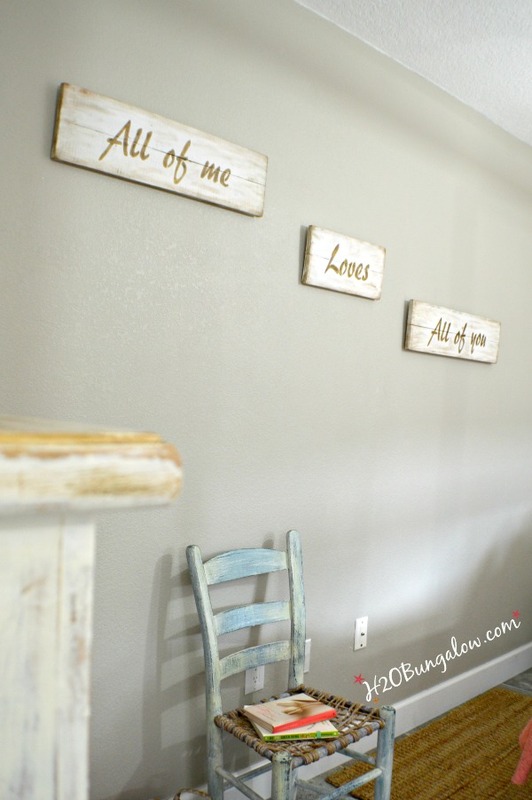 I think my DIY Love Wall Plaques fit well on this big blank wall without adding bulk or breaking up the wall. They also keep the eye traveling inward which helps the room look larger. This corner is naturally dark. I used lots of light colors to brighten it up and reflect the light. 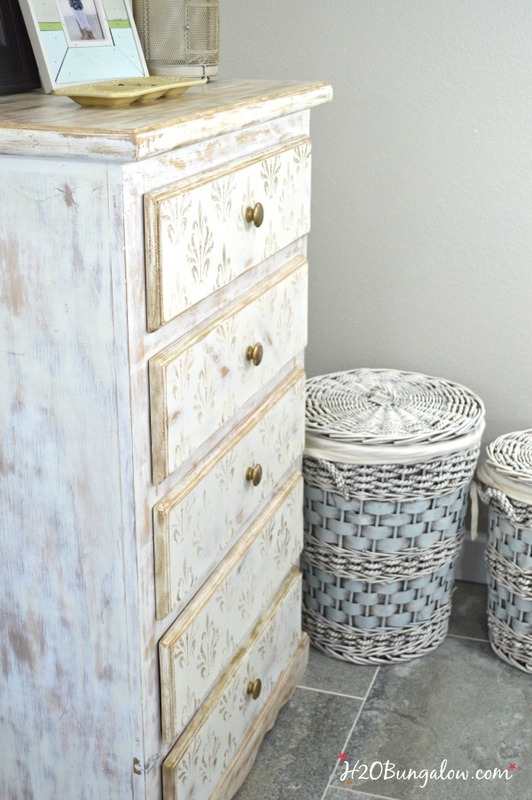 The white painted baskets next to my painted chair and dresser changed the corner from dark to bright and cheery. Remember this dresser from the original before pictures? I love the antique gold damask pattern. Decorating with neutrals help the room to look brighter and larger. My aged white nightstands are the perfect neutral for this room. I’m still loving the knobs I used! Adding a color theme and accent pieces was easy beacuse the background for everything was neutral. I love neutrals for pulling togeher a fresh coastal vibe. I also love how easy it will be to change out the colors when it’s time for a new look. I can easily take away the coral and blue accents and move to another color combination without much fuss or expense. 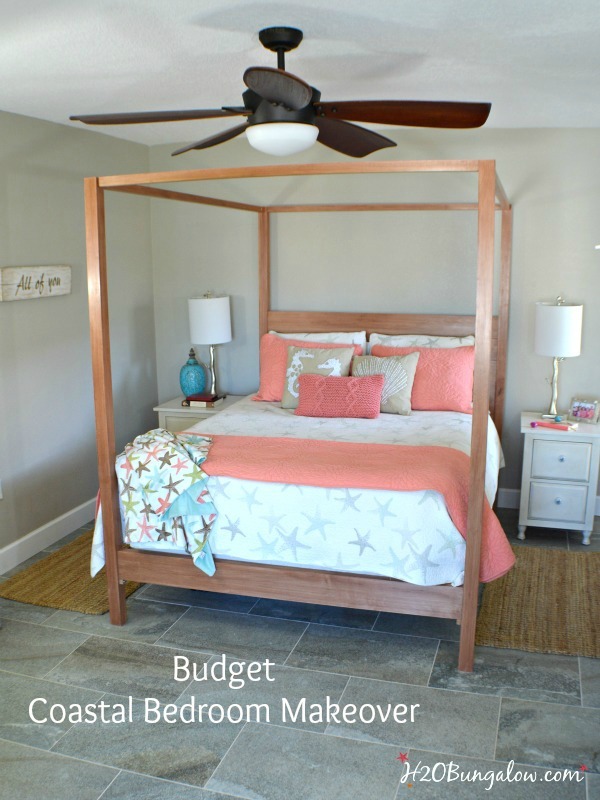 How Budget Friendly Was My Coastal Bedroom Makeover? I’ve redone every piece of furniture in this room and made the majority of the artwork. 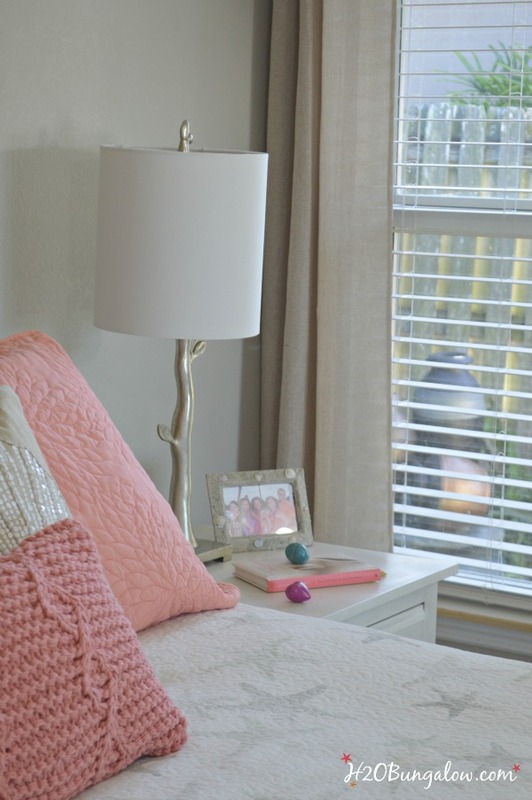 My coastal bedroom makeover was very thrifty, Yay! I spent less han $200 to makeover my master bedroom. This entire room, with everything in it cost less than $1300, including my less than $250. To update my room for this makeover. Bottom line, I spent less han $200 on my bedroom makeover. My biggest expense was the lamps. I think I did a pretty good job on my budget coastal bedroom makeover. Like I said in the beginning, thank you all so much for the swift kick in the derriere that got me motivated to finish this room. I love it! 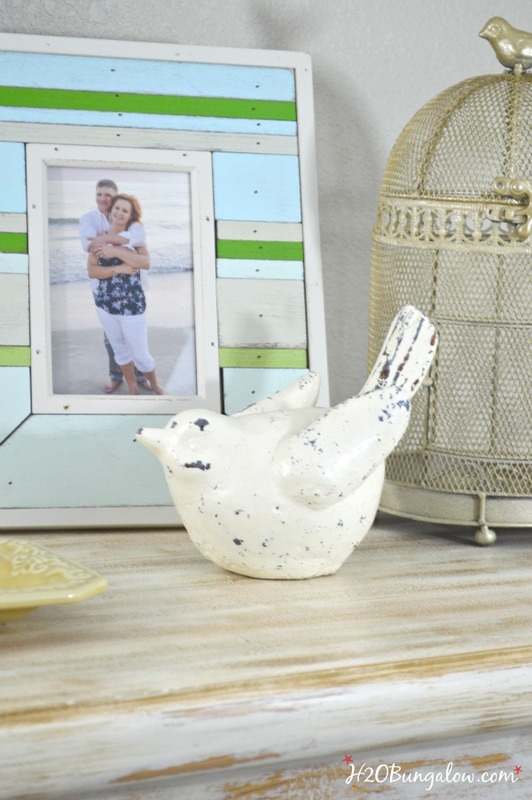 Do you have a room that’s desparate for a makeover? Share below! Tell me about those floors! Hi Barbara! We choose tile for our floors since we are by the water. These look like granite and are big tiles, 16″ x 24″. They hide the sand and dirt really well too! If you have a Floor and Decor near you they have great prices, that’s where we found these. Thanks for stopping by! Hi Barbara… Unfortunately I don’t and don’t have ay of the boxes left either. I checked our extra storage outside too. I think you’d recognize it if you saw it though. Just do a search on Floor and Decor. Good luck! I really like the touches of coral you’ve added in this room, it’s such a pretty warm color. Beautiful! I need to do a quick makeover in my master bedroom, I too am living with a lightly boring interim room. Thanks for the beautiful inspiration! Hi Kati! Those interim rooms can be tough, I found I either stopped looking at the issues and lost motivation to finish it or it made me so crazy I was grumpy. Totally an either or situation. Once I finally committed to tackling the room I realized it was well worth it! Good luck on yours and thanks so much for your visit! Wendi, your bedroom looks great! We just re-did ours and could have used your curtain-hanging tips! Oh well, I have other rooms to do where I can try it. Hi Jean, Easy curtain hanging skills are always useful! Like I shared in the post, my curtain skills were awful at one time, comical in fact! Thanks so much for your nice comment & your visit too! Great bedroom transformation! Definitely has the beach-y vibe. I’d come and stay! 🙂 Visiting from Live Laugh Rowe party. Wow, this room is beautiful! The coastal vibe is so inviting, especially this time of year, when its freezing here where I live. Thanks for linking up at #merrymonday link party! Have a great day! Thank sos much Sara, glad you liked my makeover:) I’m loving the pop of happy coastal color. So funny too, because I forget the rest of the country isn’t wearing sandals like we are here! Thanks for your visit! It looks SO much better! I love the all the coral, but I think you definitely kept it masculine enough with the blue dresser and neutrals. And that bed you built – amazing!! Thank you so much Jenny! It was a challenge adding coastal and not going too feminine. I guess it’s good to keep our spouses happy too! LOL Thanks so much for your visit! Is the $1300 correct, or the $200 for the make-over. I love that coral, Wendi! It looks so relaxing in there! And that DIY wall art is so cute! I know what you mean about dark rooms. Happens to some in our house too. I’m so envious of people with tons of light in every part of their home! Luckily, we have 4 windows in my bedroom! 🙂 Great job! Thank you Serena! I didn’t plan for that color, but when I saw it I knew it was the color we needed to finish the room:) You are so lucky having 4 windows in your room! 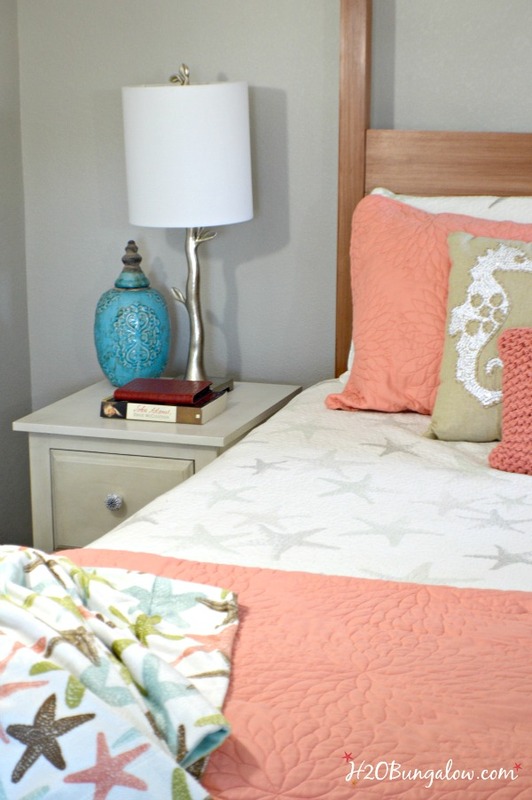 Love the pop of coral you added Wendi and I’m swooning over the pretty seashell and seahorse pillows. 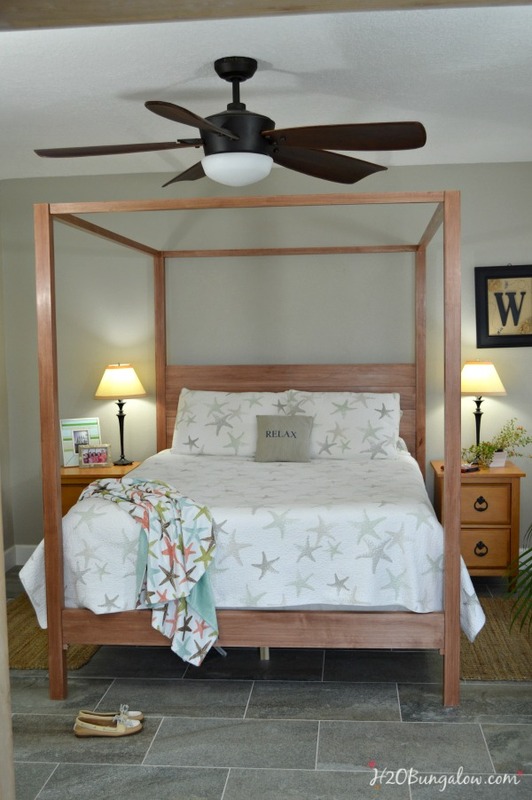 You put a heck of a lot of DIY hours into this room and injected your love of the beach in every corner. Well done my friend! Thanks so much Marie:) I didn’t mind the DIY hours, just how long it took me to actually get them done! LOL Aren’t those pillows wonderful? I had to have them. Thanks so much for your visit girlfriend! p.s. Please email me when you have a moment, I can’t seem to find your email but I have something I want to ask you… xoxo! Hi! We DO have similar tastes. I love my ceiling fan, it’s oversized and really moves the wind. I’m on the fence about painting it, leaning towards yes. You should have seen the installers face when they were taking it out of the box and I said no worries if it doesn’t match I’ll just paint it. They thought I was crazy! I love the color of the wood on the blades though! The lamps are HomeGoods! Wendi your bedroom looks beautiful and so pulled together. the color on your walls is one of my favorites and your coral accents are just gorgeous. Everything is just lovely, you did a beautiful job, it is everything a master bedroom should be. Wha? You built that bed? Tutorial pretty please! Thanks so much:) I’m happy that the light reflected so well off the different whites and neutrals, and surprised it worked so well. Aren’t those lamps perfect? Loved them as soon as I spotted them! Thanks so much for stopping by with your sweet comment, it’s much appreciated! Here I was so impressed by the beautiful coral and blue colors in your makeover and how you managed to lighten up the space using paint for the side tables and dresser, and then I read that you made the bed yourself. Respect to Wendi!! That is all I can say!! LOL… Thanks Mary! I’m very happy with the coastal vibe that didn’t turn out overdone and the colors. If it wasn’t for my readers saying they wantde more decorating, I wouldn’t have finished this room. I LOVE my bed and will share the plans and a tutorial in a few weeks:) Thanks so much for stopping by my friend!